IObit StartMenu8 brings back the Windows Start Menu. It is specially designed for Windows 8. 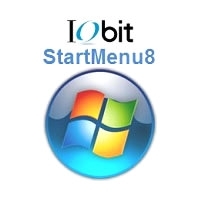 IObit StartMenu8 offers a perfect solution for users who work with Windows Start Menu all the time and are not accustomed to the new Metro start screen in Windows 8. This smart tool brings back both the start button and Windows Start Menu, and offers the option to skip Metro start page, allowing users who only work on desktop to boot to Windows 8 desktop directly. It’s the best start menu replacement for Windows8. Start Menu 8 is specially designed for Window 8. It offers a perfect solution for users who work with Windows Start Menu all the time and are not accustomed to the new Metro start screen in Windows 8. This smart tool brings back both the start button and Windows Start Menu, and offers the option to skip Metro start page, allowing users who only work on desktop to boot to Windows 8 desktop directly. It's the best start menu replacement for Windows8.